I stood under a mango tree in southeastern Uganda, holding a pad of paper containing scribbled notes on seed prices and sketches of goat pens. I was squintning at smoke curling up in the distance of the plot of land Iâ€™d been working on for a few weeks.Â A jjaja, or grandmother, in a brightly colored dress approached me and vigorously shook my hand, launching into a stream of Luganda introduction that I only partially understood.Â I smiled at her and did my best to reply to her with the formal greetings Iâ€™d learned in Chicago, the only Luganda I knew. The four other American students in my study abroad group stood around us, and the jjaja greeted them too, each with the same enthusiasm and smile sheâ€™d given me.Â Soon our collective conversation abilities ran out, though, and we turned back toward the smoke. We were at the plot of land to help a group of about 200 jjajas turn an empty field into a demonstration farm.Â It was an income-generating project for this community of women, who planned to use the money they made to improve their home gardens and pay for their childrenâ€™s and grandchildrenâ€™s school fees.Â There was a lot to do that day; the men building the brick shed needed more money for supplies, the jjajas had questions to ask before starting their meetings and working the land, and someone needed to find someone to cart water to the plot.Â The five of us could not do any of it, however, without Faustine. 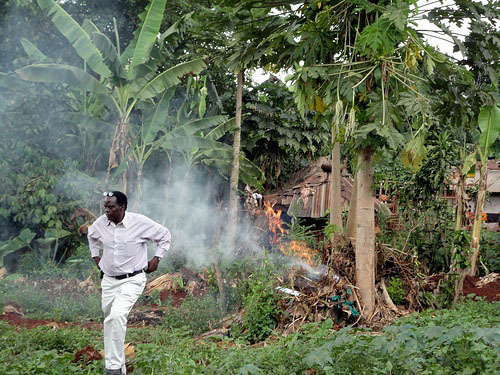 Faustine Ngarambe is the founder and Executive Director of St. Francis Health Care Services Uganda, and was the man responsible for the smoke. Faustine established St. Francis in 1998 with money he made by selling two of his cars, and had since built it up from a small community clinic to a health center that not only treats hundreds of Ugandans with life-saving anti-retroviral drugs, but also provides the community with testing and counseling services, home-based health care, and support for community groups like the jjajas. Finally, we saw him making his way back up the hill. Heâ€™d been burning piles of debris and dried plants, and now smoke marked the perimeter of the plot.Â The black Wellington boots, round glasses, and cigarette dangling from the corner of his mouth had become a familiar image for me in the weeks since Iâ€™d met Faustine.Â As I watched him accomplish tasks in minutes that would have taken me–and anyone else unfamiliar with Luganda language and Ugandan life–days, I thought back to my first day at St. Francis and the first time my group and I were introduced to Faustine. We stumbled over the Luganda greeting as we stood up to shake hands with Faustine in his office. We were trying to be polite and respectful, but it was only our third day in Uganda, and the words were still unfamiliar and awkward. Faustine chuckled and shook his head. â€œOh, I see. Lusoga?â€ I asked, naming the language of a region nearby. It was the end of that conversation, and would be the only time I heard Faustine mention his country of origin.Â The rest of what I know–which isnâ€™t much–has been pieced together from the off-hand remarks and casual talk of co-workers and friends.Â Heâ€™d been in Uganda for some time, it seemed, and didnâ€™t go back to Rwanda often, if at all.Â He still has family there, but has helped at least a few relatives establish lives in Uganda. His wife is Ugandan, and his children have grown up in a nice house overlooking the Nile. To me, an outsider in Uganda in almost every way, Faustine was as engrained into the fabric of Ugandan life and culture as one could possibly be. I still donâ€™t know why he immigrated to Uganda, or when.Â Iâ€™m sure I could have filled in the gaps if Iâ€™d really wanted to, but it just didnâ€™t seem relevant. To me, my group, the jjajas, and the St. Francis community, Faustine wasnâ€™t an immigrant. He was a translator, a businessman, and the someone who would get water to the farm, and, at least on that day when we waited for him under the mango tree, that was all that mattered.